There was something in the air that made former Bostonians Yola and Forbes Christie uproot their successful careers and youngest child to forge a new life on the windswept shores of Shelburne, Nova Scotia. Perhaps it was the Celtic heritage, fiddling and step dancing that beckoned the Scot and his American wife. Perhaps it was the air itself; cool, salty, gusting, a crucial ingredient for the rare wood flutes they would design and craft within a year of moving here in 2004. In the past three and a half years, Windward Flutes, the company Yola and Forbes founded to repair, restore and design wooden tapered bore flutes has struck a high note with traditional flautists. In fact, one internationally recognized wooden flute player recently called Windward Flutes one of the most promising new traditional flute makers going. "The instrument I make is the original flute," says Forbes Christie, pointing out that the vast majority of concert flutes produced today are made from precious metals. Having worked with Brannon Brothers and Powell Flutes, both prominent flute-making companies, for 15 years, Forbes has applied his experience and knowledge of acoustics and airflow to traditional wooden instruments. "I have given a very old instrument at new take on life." Yola explains that many people are moving over to the traditional wooden flute which has a gentleness and richness that cannot be recreated with metal. In the days of wooden flutes, flute makers would sit around and talk about their bores, the body of the flute, which was ever-changing. Each maker had their own ideas about how to make it and how the airflow would be affected by various curves and indents. The Windward flute bore was developed in 1860 by Pratten and perfected by Forbes’ experience and understanding of metal instruments. 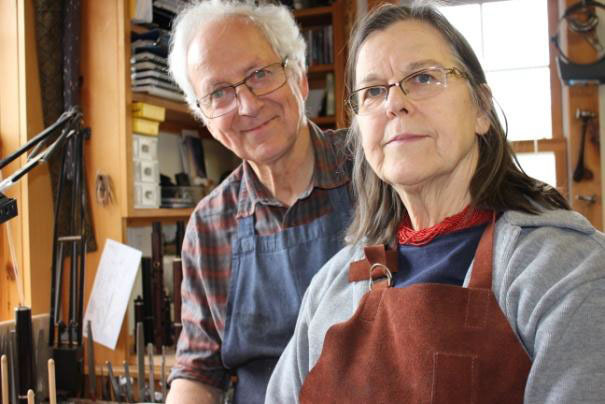 It does not go unnoticed by the couple that their business has taken root in a town built during the same period as the original instrument they produce. Windward’s flutes are made from dense tropical woods like grenadilla, mopane, and African olive imported directly from a South African timber merchant. The head joints are engraved in New England. This worldwide supply chain pares down to a level of accuracy unknowable to the human eye. Forbes Christie, who has worked in both aeronautics and flute design, mildly agrees that there is something "quite special" about his creations, which are painstakingly hand-crafted and designed to be accurate within two one-thousandths of an inch. (Precision is Forbes’ genetic gift – his uncle was a toolmaker for the aero engine division of Rolls Royce). "It’s a challenging craft," says Yola Christie. "There are so many steps along the way where things can go wrong." Or, in Windward Flutes case, go right. This year, Chris Norman, one of the world’s top flute players, invited the firm to be the featured flute maker at the Boxwood Festival, an international flute festival held annually in Lunenburg. Yola explains that "one of the reasons we came here was to connect with the wooden flute market; the festival is an excellent opportunity." She continues, "As our business grows and flautists come to our shop to pick up their instruments, we hope that they will stay to enjoy the area and give a concert at the local theatre." As Shelburne gears up for the celebration of the 225 Anniversary of the Loyalist Landing, the Christies are busy preparing to make a traditional fife (a small flute often used in military or marching bands). The instrument will be called the Shelburne Fyfe (this spelling was used when the instrument was originally made) and will be part of the reenactment celebrations. Pear wood is the ideal medium for the reproduction since that would have been the wood of the original instrument. The community is fascinated by what is going on at Windward and their visits are welcome. Yola stresses, "Every time we have visits from people the questions we are asked help us redefine our practice and making of the flutes." With a wide range of visitors including bagpipers, quilt makers, and even architects dropping by, Yola and Forbes would love to see a flute teacher bring their students around to see the process of the instruments. One of only a handful of quality wooden flute makers in the world, Windward is steadily building its reputation as a designer of flutes of the highest craftsmanship and perfect balanced tuning. Of course, craftsmanship is all about the art of revisiting one’s mistakes, reworking, revising and perfecting them. Yola Christie says her firm’s dealings with their local CBDC have helped them learn to perfect the art of running a business. "Every time you fill out an application, every time you go for an appointment, you’re revisiting your business plan," she says. "The CBDC has helped us look at what we’re doing, what we have accomplished, and how we can better achieve our goals," she says. Which, for a pair of artisan-entrepreneurs can be a breath of fresh air.